The fact that Empire Garages, in Enfield, North London, has the highest rating in the Good Garage Guide should speak for itself. But we decided to go along anyway, in order to find out what makes it so popular with HonestJohn.co.uk users. The garage itself has everything most motorists would need – there’s a filling station, a 24-hour convenience store and, of course, the workshop itself. The boss, Ajay, completely rebuilt the entire workshop in 2014, installing new floors, new equipment and some extremely clever two post lifts that wouldn’t look out of place in a luxury garage. The workshop, waiting room and forecourt are kept clean and neat and the staff are friendly and helpful. So far so good – but there are plenty of garages that are clean and tidy, so we asked Ajay what makes Empire different. We were surprised when he told us he isn’t a mechanic – but that’s the key to the garage’s success. Ajay leaves the spanner-wielding and car fixing to his staff and instead concentrates on customer service – in minute detail. The 24 hour convenience store, for example, is not just a place to buy snacks – it also means customers can drop off and collect their car for its maintenance, service or MoT literally whenever they want. And if that isn’t convenient enough, the staff will collect or deliver cars in the local area. The team will guarantee to beat like for like prices from nearby competitors and will even reward people who find a genuine better quote, such is the dedication to value-for-money. But it’s not just locals who visit – customers from as far away as Wales come to Empire Garages. 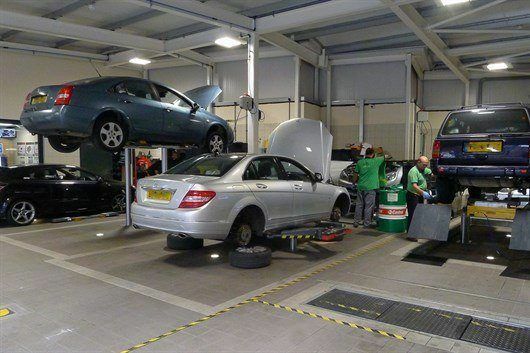 The usual array of garage services are offered, including brake repairs, tyre replacements, cam belt changes and MoT tests. Routine servicing is anything but routine at Empire – the checklist is tremendously comprehensive and goes right down to inspecting the pollen and pollution filters for the cabin. You can read all of the reviews, or leave your own, by clicking here. If North London is too far to travel, we also have a list of the ten best garages in each of the regions of the UK – click here for more information.